Here are the features that Microsoft is killing in Windows 10 1803. There are two lists, features that have been removed and features that Microsoft has stopped working on. Note that Windows 10 1803 is also known as the “Spring Creators Update” and “Redstone 4”. Groove Music Pass Groove streaming music service sales ended in 2017. The Groove app is being updated to reflect this change. You can still use Groove Music to play the music on your PC or to stream music from OneDrive. You can use Spotify or other music services to stream music on Windows 10, or to buy music to own. People “Suggestions” No longer include unsaved contacts for non-Microsoft accounts so you will have to manually save the contact details for people you send mail to or get mail from. “Language” Control Panel App Now use the ubiquitous “Setting”s app to change your language settings. Connect to suggested open hotspots This was a cool idea that openned a big security hole so Microsoft killed it. You can manually connect to free wireless hotspots with Network & Internet settings, from the taskbar or Control Panel, or by using Wi-Fi Settings (for mobile devices). People app no longer shows email when you’re offline or if you’re using a non-Office 365 mail account In Windows 10, the People app shows mail from Office 365 contacts and contacts from your school or work organization under Conversations. After you update to Windows 10, version 1803, in order to see new mail in the People app from these specific contacts, you need to be online, and you need to have signed in with either an Office 365 account or, for work or school organization accounts, through the Mail, People, or Calendar apps. Please be aware that you’ll only see mail for work and school organization accounts and some Office 365 accounts. XPS Viewer On its way out. If you have a fresh install, the XPS Viewer can be added via FEATURES ON DEMAND. If you have XPS Viewer and you update to Windows 10, version 1803, you’ll still have XPS Viewer. Offline symbol packages (Debug symbol MSIs) Microsoft is no longer making the symbol packages available as a downloadable MSI. Instead, the Microsoft Symbol Server is moving to be an Azure-based symbol store. Windows Help Viewer (WinHlp32.exe) All Windows help information is available online. The Windows Help Viewer is no longer supported in Windows 10. Contacts feature in File Explorer Microsoft is no longer developing the Contacts feature. Instead, you can use the People app in Windows 10 to maintain your contacts. Phone Companion Still exists but has been replaced with “Phone” page to help you sync your mobile phone with your PC. 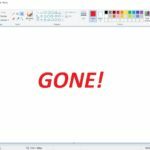 Beyond the features above, Microsoft also moved MS PAINT from the base install to a program available for free from the Windows Store, in Windows 10 1709 (fall 2017).